Life is complicated. We need a lot of tools to get by, and not all of them are convenient to have on hand 24/7. You COULD carry around a bunch of items with you everywhere you go, your overflowing pockets spilling out their contents with every step you take. Or you could just get a smartphone. A smartphone manages to accomplish the tasks of everyday items while also being super compact and convenient. Many smartphone users don’t even bother owning the items their phone mimics. But which items have become the MOST obsolete? 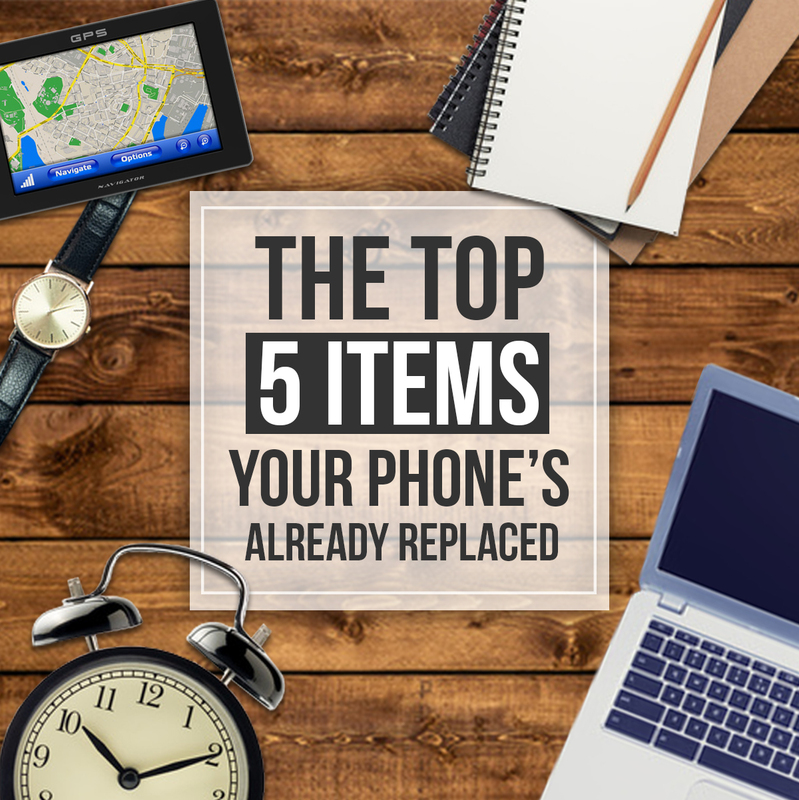 Here’s our Top 5 list of items your smartphone may have already replaced. Even if you aren’t the note-taking type, a smartphone’s sheer convenience can be enough to change your tune. Most smartphones have a notetaking app that lets you quickly jot down things you want to remember for later. Your grocery list is a whole lot harder to forget when it’s always in your pocket! Taking notes on your phone also has the advantage of not requiring a pen. No more hunting around for one when you have a bright idea. You can also more easily take notes without a hard surface to lean on. A very underrated quality of phones! Physical notebooks are by no means obsolete. But when it comes to quickly getting your thoughts into words, its hard to beat the convenience of a note app. You probably won’t miss this one. Gone are the days of needing a device specifically to wake up in the morning. Now you can trust that to your phone, just like everything else. Setting multiple alarms is super easy AND you can use them for a plethora of situations. Cooking food and need a timer? Yep. Need to know when to stop your workout? Check. Want to hear a really loud noise in a set amount of time? 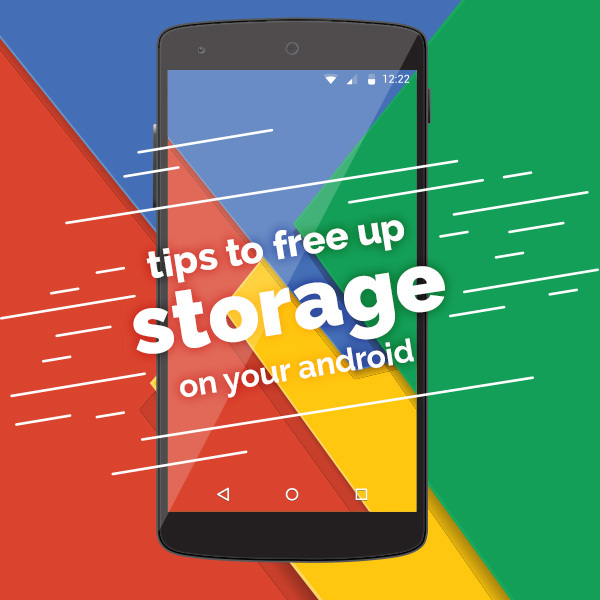 Your phone’s got you covered. This is another example of smartphones giving an item’s function more utility. Alarm clocks would be way less useful if you had to carry one around everywhere you go. But thanks to smartphone’s, that’s not even a consideration anymore. When was the last time you thought to yourself, “oh dang, I forgot my compass”? But hey, now if you ever need one, it’s readily accessible. That’s one of the best parts about smartphone apps; they’re useful when they’re useful, but if they aren’t, it’s not like they’re an inconvenience. Besides the all-useful compass, phones also replace GPS units quite handily. Smartphones are generally smaller than the average GPS, and you have several navigation apps to choose from. More options, smaller package. While GPSs are better at being maps than maps, phones are now better at being GPSs than GPSs. Who knew? I’m willing to bet that if I asked the average person to tell me the time, they’d reach for their phone. Nowadays, you’re more likely to remember your phone than any other item. Plus, people look at their phones so much throughout the day that they’re almost always aware of the time. Phones also automatically adjust their times based on daylights saving and changing time zones. Additionally, they adhere to a set, universal time. No more wondering if your time is off. Despite these advantages, a phone will still never be as stylish as a watch. So at least they’ve got that going for them! Alright, I know. People still use these. But for a lot of people, their phone IS their primary computer. A phone is portable and doesn’t require wifi to function. You can easily access the internet and perform many actions that a desktop could. Gaming, video watching, and instant messaging can all be done on a smartphone, albeit on a smaller screen than a desktop. Of course, tasks that require the precision of a mouse will always work best on a PC. Spreadsheet work, more serious gaming, and document writing are all infinitely more comfortable on a personal computer. But for literally everything else that doesn’t require a mouse and keyboard, a phone works just fine. And besides, you can’t always have your computer with you. While we’ve only listed five examples, phones encompass far more than just the items above. Calculators, calendars, music players and more all come packaged into one tiny, effective device. Oh, and it’s also a telephone. Can’t forget that. While a smartphone may or may not perform these tasks as efficiently as the actual items, it has one advantage over all of them: it’s everything at once. Sure, you might find a better alarm clock. But is it also a calculator/game system/GPS/phone/notebook? The raw utility of a phone has cemented its place in our lives. Which is why losing it is such a big deal. If you’re part of a low-income household or receive government benefits, you might be eligible for a free smartphone with free monthly service! 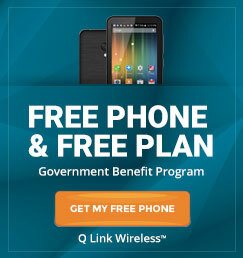 Q Link Wireless, through the government-funded Lifeline program, provides those in need with smartphones and service. Everyone should have access to these essential tools, regardless of income. So, if you’re interested in replacing your calculators, alarm clocks, notebooks, clocks, etc., sign up and grab your free smartphone today!